Once upon a time, politicians and their handlers jumped at the chance for an opportunity to appear in a TV story. Nowadays, there’s frequently an undercurrent of suspicion and hostility that seems disproportionate to the potential risk. This year, I found this to be especially the case with two members of Congress: Rep. John Barrow and Rep. Sanford Bishop. Barrow’s handler eventually and grudgingly gave me an opportunity to talk with her guy. Bishop’s never did. I visited Bishop’s southwest Georgia district anyway. What follows is an email I wrote but decided to not send to Bishop’s guy shortly before departing for Albany. As you know, I contacted you several weeks ago requesting an interview with Congressman Bishop. During that time you’ve either a) said I’d have to “wait” until “later,” or b) ignored the requests altogether. Last week, I sent two more emails and left at least two voice mails. You ignored them. I sent another follow-up, wherein I told you that I intended to visit the district to produce a story on the campaign, regardless of your willingness to cooperate. I suggested it may be in Bishop’s interest to cooperate, given that his absence in such a story would raise legitimate questions about his accessibility. A couple of days later, I got a bellicose phone call from a man identifying himself as the campaign manager. He said that because of the “threat” implied in my email, he would decline the request. Allow me to appeal to reason, if that’s possible. First: It’s clear your campaign was stonewalling me. Yet the race is legitimately newsworthy. Bishop is an endangered Democratic incumbent in an election year where Republicans are expecting to ascend to power. Although the second district isn’t in metro Atlanta, it’s a story that’s of interest to our viewers. Second: I didn’t threaten anybody. Actually, as a professional courtesy, I gave you a heads-up that plainly conveyed our intention. I know a lot of folks in the political publicity business. Most of them strive to avoid being conveyed as too slippery to answer questions (unless their lawyer advises them to do so). I felt you deserved to know that our coverage of the race was inevitable, regardless of your participation in it. You may call it a “threat” if you like. I realize that political campaigns are in the business of taking plain language and twisting it to mean something sinister. Though it seems ill-advised to do that with somebody who’s offering a bit of free media exposure, you can do whatever you want. Heaven knows, Cynthia McKinney won plenty of elections without ever talking with guys like me. Third: As folks tied to the world in Washington DC, you should be accustomed to a fact of life in the news biz: The story frequently gets covered, regardless of how much one of the players may want to stonewall or cry about it. So here’s another heads up: I’m visiting your district tomorrow. I’m going to talk to Bishop’s opponent, Mike Keown. I’m going to do a story on him, the race, and Bishop’s unwillingness to respond to weeks of interview requests. If you’d like to alter your stance and make Bishop available tomorrow, I’d like to talk with him. If not, I’ll produce the story without your input. As I told your campaign manager person, I’m not interested in posturing or jousting with Bishop’s handlers. I want to talk with Bishop. You’ve had nearly a month to make it happen. If you’d like to show me a fraction of the professional courtesy I’ve shown you, please contact me tomorrow morning. 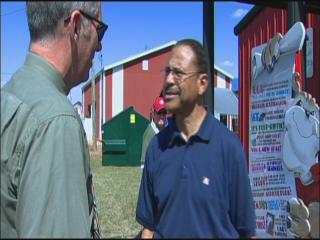 The following morning while en route, a reporter in Albany told me I might find Bishop at an event in Moultrie. Photog Steve Flood and I hunted him down and produced this story. I told Bishop that I’d tried for weeks to schedule an interview. He told me media “out of the district isn’t a priority.” I get that. Yet it would have cost them zero resources to tell me to meet Bishop at the event in Moutrie, where I took all of ten minutes of Bishop’s time. If you’re a political handler, please post a comment explaining why this makes sense. This entry was posted in WXIA on October 31, 2010 by live apt fire. Thanks, Bud V., whose note Mrs. LAF found in a box this month. Yes, I would like to respond. Thanks for writing. Sorry I’m nearly sixteen years late. I am in receipt of your critique regarding my “presumed afro” and its impact on your viewer reception. 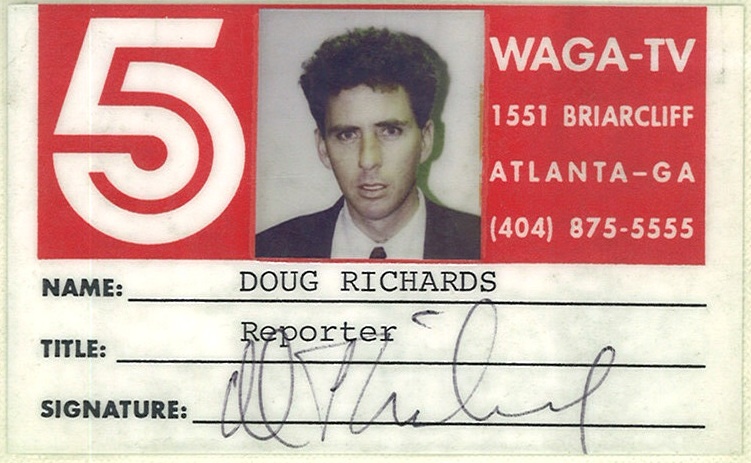 At the time you wrote this note — January 1995 — my haircut (“hairstyle” would be too strong a word) was a peculiar eraser-shaped gravity-defying pile that lacked the shape expected in your stereotypically square-jawed TV reporter. It isn’t surprising that it upset you. Presumably, your letter reflected the feelings of thousands of other viewers. One could conclude that this channel-switching look may have singlehandedly accounted for WAGA’s inability to catch WSB in the ratings in the 90s, a permanent legacy that continues to this day. Sorry about that. Regrettably, this “discord,” as you call it, continues. 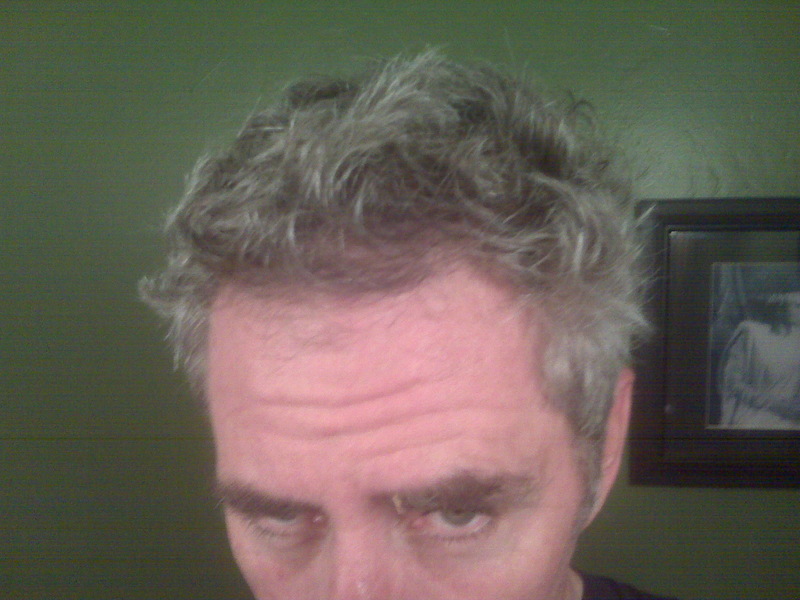 Though the hair has changed color in the last sixteen years — close inspection of the above photo would reveal the first gray strands — its unruly character hasn’t. Neither has my discipline to cut it effectively and regularly. For the last ten years, an elderly man with hand tremors has cut my hair in a storefront behind a barber pole. He charges $14. I usually give him a twenty; it’s still a bargain compared to the $40 I paid for the haircut shown above, coiffed by a charming woman named Gina at a Buckhead salon that offered shampoos and head massages as well. Though the exchange rate has improved and the hair is cut shorter now, the quality is currently very spotty. This means that each 21st century haircut results in a moment of hell-raising by Mrs. LAF, who denounces the haircut, the shaky-handed barber and my general inability to make sound decisions. This blowback now frequently results in haircut procrastination, thus yielding wiry old-guy offshoots from the ears, brows and neck, and a freakish, spiked Einsteinesque look that seems to only lack the mustache and the brainpower. In other words, zxtime@aol.com, the discord continues; the lesson goes unlearned, despite your gentle suggestion to the contrary back in the mid-90s. WXIA is now saddled with a bad hair day that has gone on for more than two decades in Atlanta TV. Thanks for watching back in 1995. Perhaps you are among the viewers slowly switching to WXIA, where you can find top-notch, stress-free haircuts among the likes of Jerry Carnes, Ross McLaughlin and Ted Hall. Please feel free to use my appearances on TV as an excuse to grab a soothing beverage from another room. 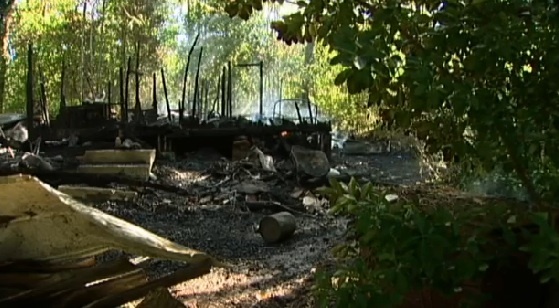 This entry was posted in veazey bud, WAGA, WXIA on October 25, 2010 by live apt fire. Political campaigns aren’t held to any standard of truthfulness, except by other political campaigns or the news media. Likewise, news organizations have no law or regulatory panel that scrutinizes and enforces veracity. In that sense, they have a lot in common. You don’t see local news organizations doing it because they have standards and lines they’re unwilling to cross. Don’t laugh. It’s true. Political campaigns, on the other hand, do it all the time. Lt. Gov. Casey Cagle is currently running a TV ad claiming that he “protected educational funding.” It appears to overlook some $600 million in education funding cuts the legislature enacted this year. Yet his campaign web site cites certain facts which, it says, back the claim. It’s classically Orwellian, but it’s the currency used by campaigns of both major political parties. The truth is molded to fit a storyline. And because somebody always wins the election — typically, irrespective of their relationship with the truth — the campaigns keep doing it, election after election. So it may have been natural for Roy Barnes to have taken a piece of news-style footage, and enhance it with made-up audio, for a TV ad. Likewise, it was apparently natural for Nathan Deal to create, for a TV ad, newspaper headlines and quotations that didn’t exist. The Barnes footage came from Jim Galloway’s blog, apparently shot by a campaign operative following a debate last week at The Temple. In it, Nathan Deal rapidly exits the building while a reporter barks questions that Deal ignores. 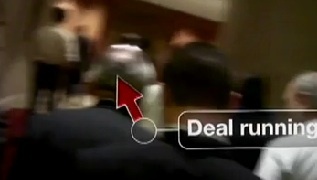 On the video, y0u hear the voice of only one reporter. 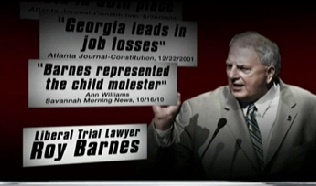 Barnes’s campaign got hold of the video and “sweetened” the audio, in a way that gives the impression that numerous reporters were hollering at the elusive Deal. Then he put it on TV in an advertisement. This resulted in a story by Jon Shirek on WXIA comparing the two pieces of video (I can’t embed it here, for some reason), followed by an enormously entertaining give-and-take between Barnes and Jeff Hullinger on the same topic. News organizations do shape truth. We call it “editing.” For example, a candidate may give a convoluted answer to a question (or a reporter may ask a convoluted question), and the slick TV news editor will eliminate the awkard verbiage and retain the material that conveys the meaning. We also add audio in narrative voice tracks. On rare occasions, I’ve seen questions or natural sound enhanced. That’s mostly against the rules (see above, “don’t laugh”). 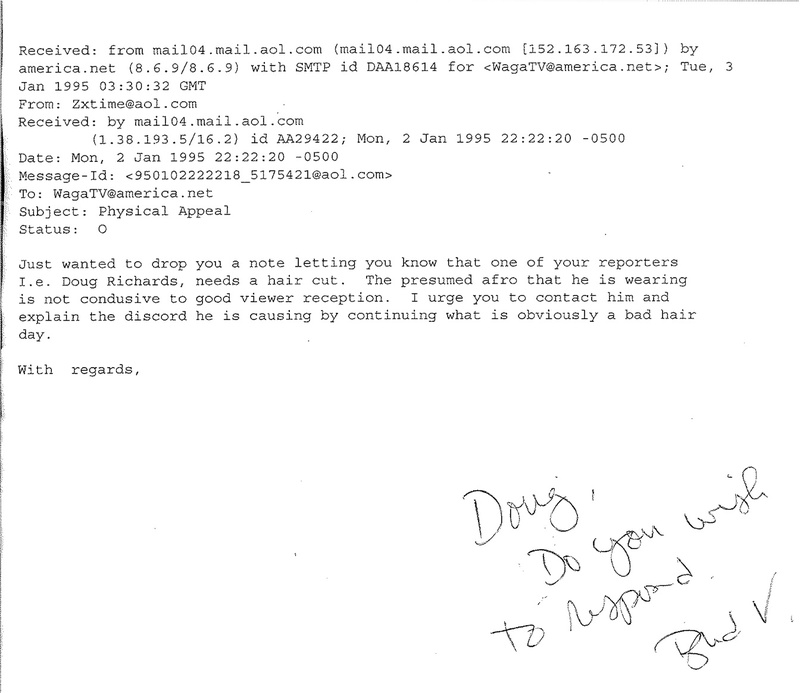 Barnes added voices and questions that weren’t asked in that piece of footage. Barnes told Hullinger that the audio didn’t change the storyline: Deal refused to answer questions. But it certainly made Deal appear to be cowardly, rather than a guy who might have been in a hurry to get to his next event (having answered questions for sixty minutes in a debate moments earlier). It also fails to take into account the fact that Deal answered every question thrown his way at an event the following day. But Deal can’t bellyache too much. By paraphrasing a comment from Barnes’s spokeswoman, then turning it into a made-up newspaper quote, Deal’s campaign is guilty of exactly the same kind of distortion. None of this will stop each from indignantly accusing the other guy of lying. How dare he. On November 2nd, one of these guys will get elected Governor of Georgia. And the next round of campaigns will observe whatever worked for the winner, and use the same tactics again. This entry was posted in WXIA on October 21, 2010 by live apt fire. I’d expected a crowd. Instead, when we arrived at the Richard B. Russell Federal Courthouse for the probation revocation hearing of the rapper known as T.I., there were four people waiting. WXIA photog Dan Reilly and I got there about 75 minutes ahead of the scheduled 2pm hearing. 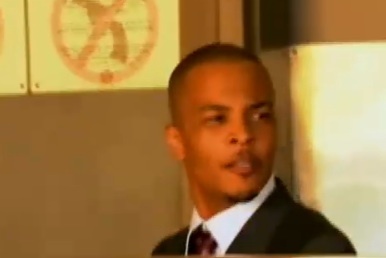 Truth is, I kinda figured that T.I., whose real name is Clifford Harris, was already in the courthouse. He had four well-known Atlanta lawyers from three different firms on his defense team. Given the fact that they’re all paid by the hour, the advance briefing could have taken days, much less hours. And it was likely already underway somewhere inside the 23 story courthouse building. But these folks were staked out at the rear of the building. The actual main entrance was on the opposite side, and there was another at the basement level. WXIA had sent another photog to stake out the lower entrance. Reilly and I walked to the front. The four others followed. As we arrived in front, a woman in a serious suit passed us. “Just waitin’ for T.I.,” I said. “He’s not here yet,” she answered with authority, as if she actually knew what she was talking about. “2307,” she added, correctly giving the courtroom number. Then she ducked into the front entrance. She’d said what I wanted to hear, whoever she was. Yet I was only slightly encouraged. There was plenty of other news Friday; getting a moving picture of T.I. entering the courthouse apparently wasn’t a Code Red priority for anybody except a couple of paparazzi. A proper stakeout takes a commitment of resources: At least two photogs, who probably should have begun their stakeout at 8am at both entrances. Except as a piece of photojournalism, the news value of the shot was negligible. We all know what the guy looks like. He was unlikely to say anything newsworthy, if he said anything at all. And yet — it’s the kind of shot you’d hate to miss, especially if a competitor has it. 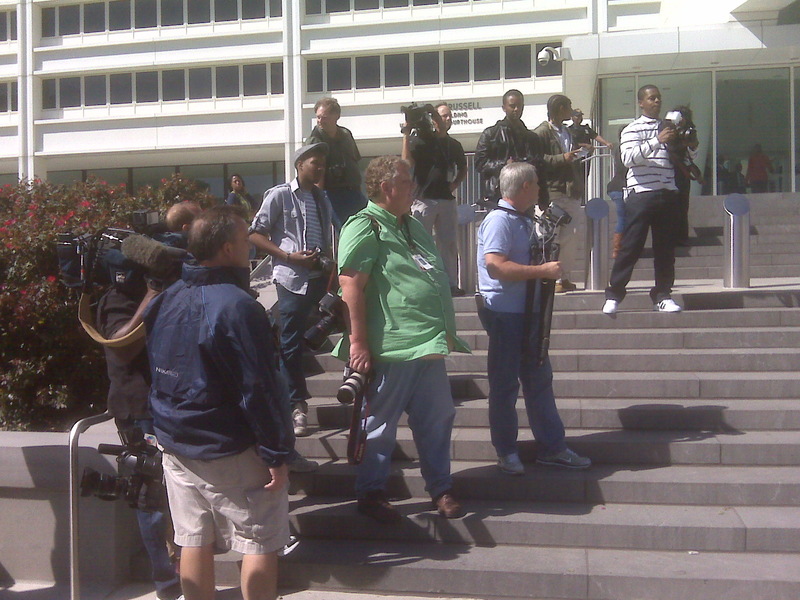 As we stood outside the front of the courthouse, other TV stations and freelancers showed up. Even a CNN crew made the four-block walk to the stakeout. At this point, folks with cameras just camped out wordlessly next to us. They appeared to simply assume that, because a scrum was slowly enlarging outside the courthouse, there must be a good T.I.-related reason for it. By the time I abandoned Reilly and went inside, about thirty people were waiting with him. When I got to the 23rd floor courtroom, Clifford “T.I.” Harris was sitting on a bench with his attorneys. He apparently managed to enter the building without being photographed, probably hours earlier. Since we’d missed T.I.’s entrance, it became essential to cover his exit. Local TV stations sent extra photographers to cover the basement exit, which sits in an industrial gulch below street-level, lodged within a parking lot, a loading dock and several sets of railroad tracks. After the hearing ended, I played a hunch and told Reilly I was going downstairs. T.I. had just lost his bid to stay out of jail. Losers in the courtroom don’t typically hold news conferences on the steps of the courthouse; they usually slink out of the basement. WXIA photog Stephen Boissy had seen T.I.’s wife exit downstairs moments before I arrived. 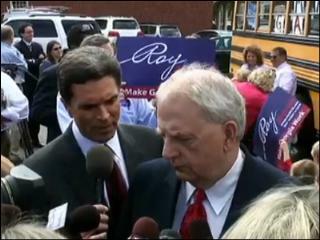 After I’d gotten there, his attorney Ed Garland exited. “I’m not going to make any comment…” he began before telling the assembled cameras how disappointed he was, and answering a follow-up question. A few minutes later, Garland drove his BMW up to the exit door, sixty feet from where the US Marshals had allowed the downstairs cameras to assemble. T.I. exited the courthouse door, opened the passenger door, then stopped. He waved to some people, standing there long enough for photogs to zoom in and focus, then slowly ducked into the car. “Mr. Harris, could you stop and answer a question?” I hollered halfheartedly. Upstairs, the majority of the T.I. stakeout was recording a news conference by the prosecutor. Harris ignored my question. 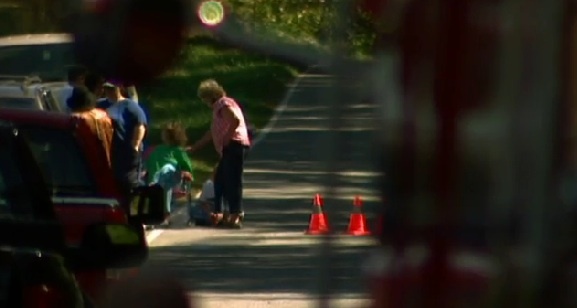 A few TV photogs sprinted ahead of the car to record the vehicle’s exit. Boissy’s video image of Harris lasted just a few seconds, the end product of about six man-hours of stakeout. During her confirmation hearings, the newest Supreme Court justice Elena Kagan suggested that cameras should be allowed to cover SCOTUS arguments. If this happened, it could allow cameras into federal courtrooms. Overturning this Warren-era restriction is long, long, long overdue. Thanks for asking. This entry was posted in WXIA on October 18, 2010 by live apt fire. 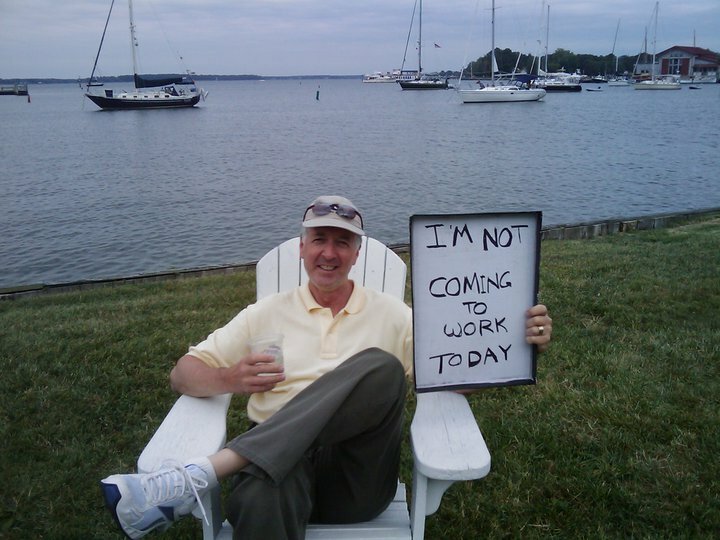 Marc Pickard retired from WXIA in September. It was bittersweet for all of us. Pickard is a gifted storyteller, and a guy who probably never had an undignified moment in his entire career. 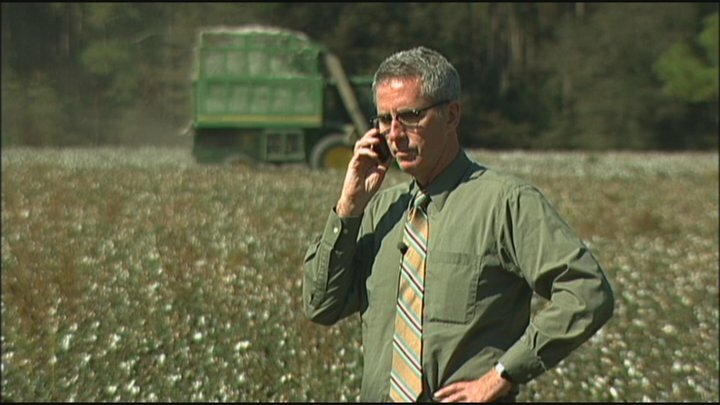 Even when he covered breaking news, Pickard was at his best. His retirement process paralleled my own departure from WAGA in 2007, kind of like the end of the Pittsburgh Pirates season parallels that of the New York Yankees. Both of us left voluntarily after two decades. The similarities end there. Pickard was an elegant DiMaggio, a graceful hall of famer. 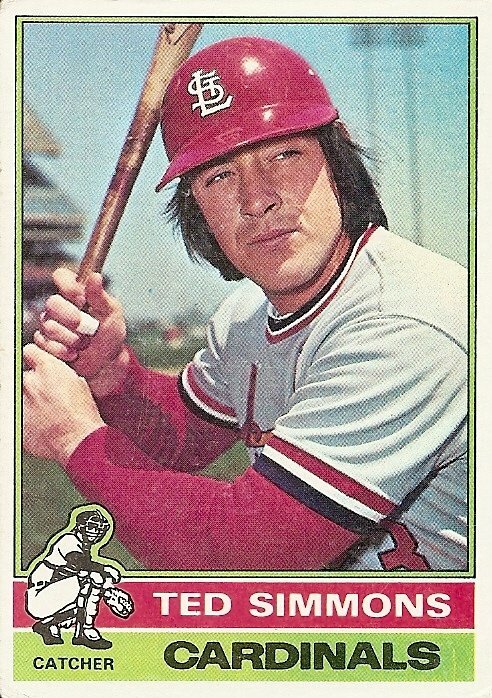 I am more Ted Simmons, an affable but clunky backstop with an erratic bat and no speed. Pickard got a champion’s sendoff, the equivalent of a parade downtown. I got the exit of a guy who spent his last seasons growing tomatoes in the bullpen at Atlanta Fulton County Stadium. In hindsight, it makes perfect sense. Pickard: A staff meeting is called during late Spring, and his retirement is announced. Pickard is halfway-seriously told he will be able to select “any story he wants” during his final workdays. Richards: I post a handwritten, one-line letter of resignation on my desk. Passersby may or may not notice it. Pickard spends his final two days working with Mike Zakel, a photographer with whom he had traveled the world and developed a close relationship. Richards is assigned to work his final shift with a photographer he’d never shot a story with previously. Pickard’s final story is a classy retrospective of his career at WXIA. Richards’ final story was a stakeout at a home where a murder-suicide had taken place nearly a week earlier. Pickard completed on-air delivery of his final story, upon which the studio filled with coworkers and applauded Marc on-air. Richards delivered a forgettable 5:30 live shot, then was told to “swing by” downtown Fayetteville and back up another reporter on another story before returning to Atlanta. Pickard’s departure was capped with an in-house party, where a tribute piece was shown. Former colleagues were invited. Richards’ departure was acknowledged with miniature Publix muffins and orange juice during the morning editorial meeting, a two-fer with Mike Daly, who departed the same day. Pickard’s departure party had a large spread of food and drink, paid for by WXIA. Richards and Daly got stuck with a $400 + bar tab at a Manuel’s Tavern sendoff that night. Pickard was the object of an in-house tribute movie short. It was filled with ridiculous cameo appearances by current and former colleagues. The short led into a fifteen minute “this is your life” -style piece about Pickard’s career and such. – writing clichés easily embraced by our industry and loathed by Pickard. The cast, in order of appearance, are Jeff Dore, Jill Becker, Watson, Richards, Jeff Hullinger, Mayer, Bill Liss, Mark Winne and — a surprise cameo. Wait for it. This entry was posted in pickard marc, watson jaye, WSB, WXIA on October 5, 2010 by live apt fire.